SaySo4Profit.com Reviews - Legit or Scam? SaySo4Profit.com Reviews – Legit or Scam? 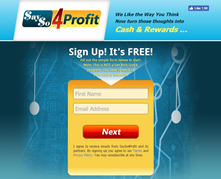 SaySo4Profit.com is the online home of the SaySo4Profit, is a company that says they were established in 2005 in order to help people of all ages and demographics to get paid for their opinions. Their website says that big name companies throughout the United States spend more than 30 billion dollars on opinion research in order to “get inside consumers’ heads” because of how valuable customers opinions are to new and existing products. Because these companies understand how valuable customer opinions are to them, they are willing to pay people for these opinions, making it an excellent opportunity for anyone looking to earn supplemental income or even monthly income. The website says that they will teach their members how to join carefully selected survey panels, get money for inviting your friends to join survey panels, answer surveys online, participate in collective interviews, get paid for mystery shopping, and more. In addition, this website says that they offer all of this education and all of their resources completely for free, because they simply earn money just by pointing you in the direction of the companies that will pay you for surveys. Paid market research is one of the oldest and most popular ways of earning money online, and there are many, many websites that attempt to earn money by “pointing” people in the direction of online survey companies. The most important difference, however, is that most of the other companies that do this, do it for a fee, while SaySo4Profit.com does it for free. That being said, this company isn’t exactly as honorable as it portrays, as it still perpetrates many of the myths and lies surrounding this industry by claiming that they will teach their members how to find short surveys that will pay them $10, or to qualify for panel surveys that will pay them $150 an hour. Do $10 online surveys and $150 an hour panels exist in the world? Maybe. But they are incredibly rare and it’s not even remotely fair to tell people that’s what they should “expect” when getting into this kind of work. The truth is that most online survey work pays maybe a dollar or two per survey, because, as mentioned above, this type of work takes no special skills or experience, it doesn’t even take that much time. So it simply is never going to pay much, and is truly best suited for people who find the work interesting and would like to get a small amount of extra money per month. Average Rating for " SaySo4Profit Reviews " is 5 out of 5 based on 1 reviews.